Pardon me, I'm trying to get back into the swing of blogging again and I'm a little behind on showing off my September mantle. October is just around the corner and the Halloween decorations are calling to me. But before I pull out the bins and re-do my mantle with a scary flair, I thought I would show off my glitzy early fall mantle. It was an easy display. A huge gold frame borders a few smaller ones with a line-up of shiny and sparkly pumpkins in front. And some candles and faux plants mixed in for interest. It was a great way to ease into the more "themed" months of October and November. What a beautiful mantel! 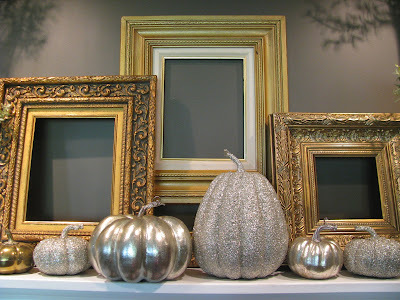 I love the gold frames & the silver pieces, a great combination. You sure do have a nice collection of gilded frames - all from thrift stores I assume? And I'm sure you did something wonderful with the paintings that used to be inside the frames too! That is so pretty! What a fun and different way to do autumn- I love it! Brown wall- check. White mantel- check. White ceiling- check. Now all I need is golden flitter and glitter and glitz and glam so my mantel can look as sophisticated as yours! I know a shop that sells golden spray paint for less than £1.50... SQUEE!! Love your display, elegant and stylish. Thanks for sharing! Gorgeous! Love all the sparkly metalics! Hi joy, it's so nice to meet you. I am your newest follower. I found you through Censational Girl. 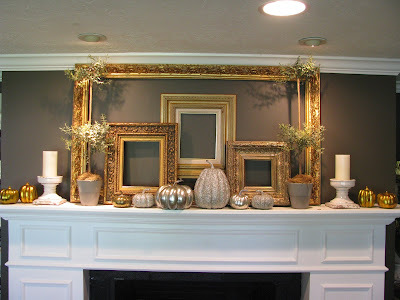 Your mantle is lovely and I especially like the use of your frames. I, too chose to use frames on mine. Those gold frames are exquisite. They really dress up your mantle. Nice to see a post...life goes on doesn't it? Thinking of you always with loving thoughts...take care. 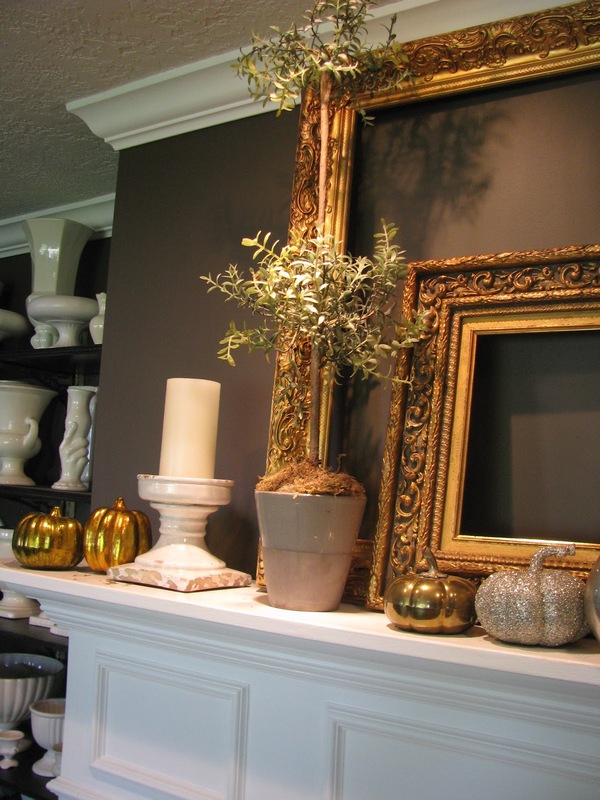 Love your "early" Fall mantle, Joy and good to see a post from you. Hope you are doing well. It's beautiful! I love the gold and silver together.